The son of James & Annie North of 11 Church Row, Thame, Frederick James North was born on 29th December 1889 and baptised at St Mary’s Church in Thame. 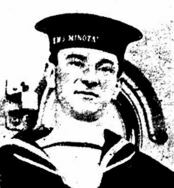 He took early employment as a weighbridge lad on the railway and then as a dairyman, but clearly longed to go to sea and enlisted in the Royal Navy in 1907 at the age of 17. He married Frances Jane Cullip in Biggleswade, Bedfordshire, in 1912 and moved to live near Sandy, Bedfordshire, where they had two children. 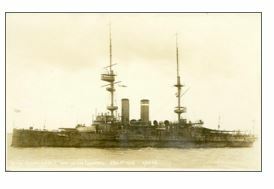 He served as a Stoker 1st Class on the battleship HMS Formidable which took two direct hits from torpedoes fired by the German U-Boat 24 during exercises on the night of 1st January 1915. The battleship, the first to be lost as a result of enemy action, foundered quickly in rough seas off Lyme Regis in the English Channel, sinking in 180ft of water about 37 miles off the Devon Coast. Only 199 men were saved out of a complement of 780, and unfortunately Fred was not amongst them. 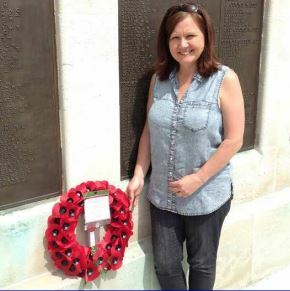 He is remembered on the Chatham Naval Memorial and in Thame on an additional plaque on Thame War Memorial.